Medical assistants play a very important role in healthcare. This career covers a wide variety of duties ranging from clinical to clerical. When it comes to selecting a place to work, medical assistants also have a wide selection. They can make their own choice because medical assistants are needed in all healthcare facilities. The medical assistant sees healthcare from every angle as they work with doctors, nurses, pharmacists, and patients. Medical assistants support physicians and other healthcare professionals by performing clinical tasks and administrative or office management tasks. A medical assistant is considered an allied health professional. This means that this individual is not a doctor, nurse, or dentist; however, they do work on the healthcare team to diagnose, treat, and prevent illness and disease. Providing clinical support to physicians is one aspect of the medical assistant’s job. They may perform some basic clinical functions under the direct supervision of a doctor. In addition to working directly with the physician, the medical assistant works directly with the patient. They take the steps necessary to ensure patient comfort and act the liaison with the doctor. A second key part of the medical assistant’s job may include managerial or administrative tasks. When working in this realm, the medical assistant works under the direct supervision of the medical office manager. Together they will ensure that all administrative tasks are completed in order for the office to run efficiently. A medical assistant can expect to earn a median salary of $33,922 annually. The lowest paid medical assistants may earn as little as $28,858 while those who are highest paid may receive $39,100. The salary varies depending on a variety of factors such as certifications and hours worked. Medical assistants who hold certifications typically earn a higher salary. Additionally, medical assistants working in clinics that are open after hours or on holidays often receive a higher wage. Before a person is able to begin working as a medical assistant, they must earn the necessary education. All medical assistants must have at least a high school diploma or GED. For those who have earned degrees or certifications, the job search process is must simpler. Their credentials and training make them must more desirable in the job market. Community colleges and vocational schools offer accredited medical assisting programs. Upon completion of the program, students receive an associate degree, diploma, or certificate. A student may earn the diploma or certificate with a year while the associate degree is commonly a two-year program. The associate degree provides more training and makes a student more employable. Additionally, the associate degree serves as a precursor to a bachelor’s degree. After obtaining a degree, certificate, or diploma from an accredited medical assisting program, the medical assistant may want to specialize. Medical assistant certificates are usually offered in either clinical assisting or administrative assisting. The students who select the clinical assisting certificate will receive education and training in properly carrying out lab work, accurately taking and recording patient vital signs, and collecting specimens. The students who select the administrative assisting certificate will be trained in performing clerical tasks such as office management and billing. Most employers prefer to hire medical assistants who have earned a certification or diploma from an accredited medical assisting program. 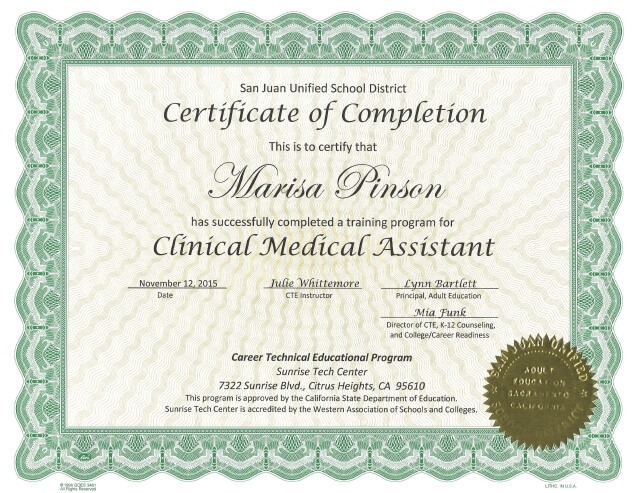 After earning the appropriate certifications, the next step is to gain some on-the-job experience as a medical assistant. Some programs start this phase during the education process. Many medical assisting programs require the student to spend a certain amount of time in a physician’s office, clinic, hospital, or another medical facility in order to graduate. During this clinical phase of the programs, students learn the proper way to take vital signs, collect specimens, carry out medical testing, manage the office, and other common clinical and administrative tasks. 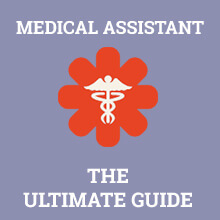 The requirements for working as a medical assistant vary from state to state. In some states, medical assistants must be certified before working in a medical facility. Even in states that do not require certifications, medical facilities prefer to hire medical assistants who are certified. Certified medical assistants have proof that they already have a certain level of knowledge about medical assisting. While each group or organization has its own governing rules, most require a degree from an accredited medical assisting program and a passing score on an examination. While it is possible to become a medical assistant with just a high school diploma or GED, most medical facilities are likely to hire those individuals who have certification and training in medical assisting. The American Association of Medical Assistants (AAMA) suggests that the most desirable path for becoming a medical assistant is by graduating from an accredited school with a two-year associate degree. These accredited institutions prepare students to take the AAMA certification exam to become Certified Medical Assistants. Every five years, the Certified Medical Assistant must request a certification renewal. By earning the degree and certification, this Certified Medical Assistant will have the most employment opportunities and will have the greatest possibility for advancement in their career. Students may also enter the workforce following the completion of a one-year program at a vocational school. After receiving a diploma or certificate from this program, they are able to work at most entry-level medical assistant jobs. A medical assistant is not required to be certified or licensed. However, many medical assistants prefer to become a Certified Medical Assistant. The certification provides proof that they have completed the requirements and met the qualification to receive the credential. Certified medical assistants are skilled and knowledgeable about their role in the medical office or facility. They are usually preferred in the job market over non-certified medical assistants. They usually earn a higher salary and have a greater opportunity for career advancement. The first step for certification is to earn a degree, diploma, or certification from an accredited program. To be eligible to take the certification test, students must be within 30 days of graduation or be within 12 months after graduation. Eligible individuals will complete the necessary paperwork. The paperwork must be submitted along with a non-transferrable, non-refundable $125 application fee. Once the application is received, processed, and approved, the candidate will receive a Scheduling Permit. By logging in, the exam can be scheduled. The permit must be presented at the exam appointment. While waiting to take the exam, the candidate can study for the test. The candidate might use professional journals and websites to locate information and practice tests. Some accredited programs even offer review and preparation courses. After appropriate education and studying, the candidate is ready to take the exam. After passing, a wallet card and certificate will be issued indicating that the person may use the title Certified Medical Assistant. To remain current and certified, the Certified Medical Assistant must recertify every 60 months through continuing education or by taking a recertification exam. The certified medical assistant will receive the designation of CMA from the Certifying Board of the American Association of Medical Assistants. This credential proves that the CMA knows and has been tested on the clinical and administrative responsibilities of a medical assistant. The job outlook for medical assisting is excellent. With an expected growth of 29 percent between 2012 and 2022, individuals just entering the workforce should not find it difficult to find employment. The expected high demand for medical assistants is due in part to the overall demand for medical care. With increased awareness of preventive care offered by physicians and other medical professionals, more help is needed in the medical offices and clinics. Additionally, the U.S. population is living to be older so this is another factor that is driving demand upward. With the recent passing of the Affordable Care Act, more people have access to medical insurance. Since more of the population has insurance, they are more likely to see professional medical attention. That's a higher than average projected growth of 183,900 jobs. Should You Become a Medical Assistant? 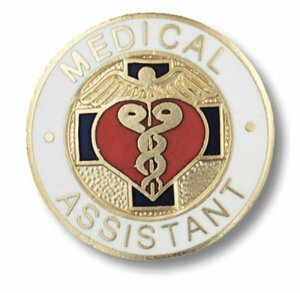 A medical assistant may be the first and the last person seen by a client in a medical facility. For this reason, the medical assistant must have good communication skills and excellent interpersonal abilities. The medical assistant must be a good listener and be able to respond appropriately. For a person who enjoys multitasking and participating in a fast-paced work environment, medical assisting is an enjoyable career. The Bureau of Labor Statistics data indicates that the medical nursing assistants earn a median salary of $31,540. Medical assistants in the lower 10 percent earned less than $22,870. Those medical assistants in the highest 10 percent earned more than $45,310. The salary is often directly related to the certifications and degrees earned. Those individuals who hold higher degrees and more certifications tend to earn the higher salary. Salary is also related to the location where the medical assistant works. Outpatient care centers provide the highest salary followed by hospitals, physicians’ offices, and chiropractors’ offices. The Bureau of Labor Statistics projects a growth factor of 29 percent from 2016 to 2026. This growth rate is much higher than that of many other occupations. As the United States population continues to age, the demand increases for preventive care. Much of the medical services needed by this age group can be provided by medical assistants working under the supervision of a physician. These individuals require routine medical evaluations which in turn increase the need for clinical assistants due to the increased administrative tasks. The length of training for a medical assistant varies with what they hope to accomplish. Individuals may become medical assistants with just a high school diploma. However, most medical facilities prefer someone with more training. Some programs last for one year and culminate with a certificate or diploma. The students graduating from these programs are eligible to study for and sit for further certification examinations. The most extensive programs last for two years and result in earning an associate degree. Regardless of the program, students are provided both classroom knowledge as well as on-the-job training. Often, the medical assistant is the first person a patient meets at a medical facility. Patients may be ill, hurting, or frightened. The calm, reassuring presence of a friendly, confident medical assistant is most helpful. A medical assistant may also be the last person a patient sees before leaving the facility. They need to provide accurate patient education in a confident manner so that patients are able to provide appropriate follow-up care for themselves. Medical assistants will be asked to record and code medical diagnoses. The information becomes a part of the patient’s record so the ability to understand and assess the logic of the charts is critical. Because medical records need to be completely precise and thorough, paying attention to details is of utmost importance as a medical assistant. Accurate medical records provide the basis for the physician’s medical diagnosis and the insurance company’s ability to pay. The medical assistant must have outstanding skills in technology and computers. The ability to accurately record a patient’s medical history and pertinent current health details is essential. They must also be able to use medical equipment to assess vital signs such as pulse, heart rate, blood pressure, temperature, weight, and so forth. With the current use of Electronic Health Records (EHRs), the medical assistant’s job is even more important. These records must be accurately maintained. Q. How Many Hours Does a Medical Assistant Work? A medical assistant works a normal business day. Most medical facilities will be open Monday through Friday; however, some may open during evening hours and on weekends and holidays. The working hours for a medical assistant will depend largely upon the facility in which they work. Q. What Does a Medical Assistant Do? Medical assistants may work in two different capacities in the medical office. They may be a clinical medical assistant who works directly with the patients and the medical professionals. Their duties may include cleaning and sanitizing medical equipment and rooms, taking care of contaminated waste and materials, performing basic tests and assessments such as blood pressure, heart rate, and weight, and meeting and educating patients. Other medical assistants are known as clinical medical assistants. Their duties include tasks related to managing the office. They may code medical information for insurance payment, answer phones, and make appointments for patient visits. Q. Can a Medical Assistant Become a Nurse? With further education and training, a certified medical assistant can become a nurse. The education, training, and experience gained while working as a medical assistant provides an excellent background for this career advancement. The medical assistant might want to become a Licensed Practice Nurse first then move on to become a registered nurse. The Licensed Practical Nurse program takes an additional two years. Following earning the Licensed Practical Nurse credential, another two years of study would be required to be a Registered Nurse. Q. How Long Does It Take to Prepare for the CMA Exam? When the medical assistant has completed an accredited program for medical assistants, they should have adequately covered the material on the CMA exam. Several online sites provide practice tests and other materials to use to assess their knowledge. Once the individual can do well on the practice tests, he or she is ready to take the exam. Q. How Often Should a Medical Assistant Get a Raise? The ability to get a raise would follow the procedure of the medical facility in which the medical assistant works. If the medical assistant earns a new certification or licensing, the need for a raise might occur sooner than their one year anniversary with the facility. Q. How Long Do You Study to Become a Medical Assistant? The shortest program for becoming a medical assistant is nine months. The longest program lasts two years and typically results in earning an associate degree as well. Medical assistants no doubt play a very important role in healthcare. From clinical to clerical, when it comes to selecting a place to work, medical assistants have a wide selection because medical assistants are needed in all healthcare facilities. Medical assistants support physicians and other healthcare professionals by performing clinical tasks and administrative. So, anyone venturing into this can have one in mind and strive to be good in that aspect. To be frank, medical assistants who hold certifications or are working in clinics that are open after hours or on holidays often receive higher wages so I always suggest such to people who are interested in the field. I actually selected the clinical assisting certificate but I’v not received solid education and training in properly carrying out lab work, accurately taking and recording patient vital signs, and collecting specimens. I hope I’m not in the wrong place. Of course, certified medical assistants are more preferred to non-certified ones. They are skilled and knowledgeable about their role in the medical office and they usually earn a higher salary and have a greater opportunity for career advancement.